The frame is all that remains of a summer camp built by the U.N. for children in Gaza after the Sunday morning attack. Gaza City, Gaza (CNN) -- A U.N.-sponsored summer camp in Gaza was burned Sunday hours before it was due to open, witnesses said, blaming Muslim extremists who apparently object to boys and girls going to camp together. 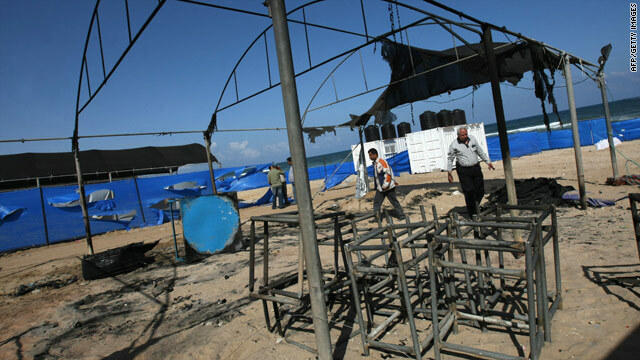 But the camp on the beach at Gaza City was burned by masked militants early Sunday morning, destroying tents. There have been no reports of injuries. "We condemn this attack on our camp and we ask the authorities to investigate. All our other camps will go ahead as planned," said UNRWA Gaza spokesman John Ging, according to the agency's Chris Gunness. Restaurants in Gaza have also come under attack recently, according to human rights activists there. An explosive was detonated at the As-Salam Restaurant east of Gaza City on May 3, the al-Mezan Center for Human Rights said at the time. No one was injured and the reason for the attack is not known. CNN's Talal Abu Rahma, Paul Colsey and Kevin Flower contributed to this report.